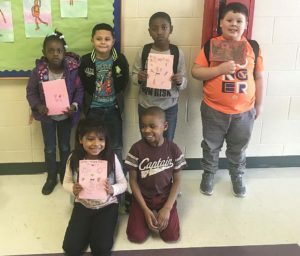 West Smithfield Elementary students created Valentine’s Day cards to share with their community members. Some of the students who created the cards on the front row (from left) are Ashley Mejia Gonzalez and Derrick Ruffin. Those who are photographed on the back row (from left) are Azariah Johnson, Antonio Lane, Zion Johnson, and Christopher Velasquez. Students from West Smithfield and South Smithfield elementary schools spread love throughout their community this month with more than a thousand handmade cards. 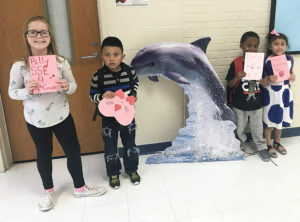 Hadley Lee, the Family and Community Engagement Liaison for the two Smithfield elementary schools, said the students created the cards in their classes as a way to teach them that small gestures of love and kindness can go a long way. 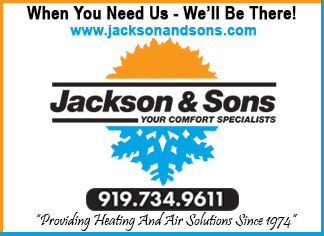 South Smithfield Elementary students created Valentine’s Day cards to share with their community members. Some of the students who created the cards (from left) are Finley Carroll, Alek Martinez, Nicarie Lane, and Emily Mendez. Lee hand delivered the cards to several local businesses and community members including Barbour Court Nursing Home, Brookdale Senior Living Center, Carroll Pharmacy, Johnston County Senior Services, the Johnston Dialysis Center in Smithfield, Johnston Health, Johnston Health Hematology and Oncology, Johnston Health Ambulatory and Imagine, Meadowview Assisted Living and Nursing Home, Millennia Cardiovascular, Smithfield Manor Nursing Home and Rehab, and the Smithfield Rescue Mission.